Anyone trying to find Minibar's website and going first for the formulaic minibar.com (the real one's at minibarmusic.com by the way) will find a delightful corporate site for minibars that offers "refreshment solutions" - given the effect after one listen, you could actually without too much of a tenuous link say much the same for the latest EP by the British (yup, really) quartet Minibar. Treading much of the same ground as their preceeding Road Movies album but now in NEW! concentrated flavour, The Unstoppable EP's only fault is that it leaves you distinctly wanting more - "Unstoppable" itself, the title track, is a classic piece of Britpop meets Americana, slowly building up to a rousing crescendo. "It is What it Is," perhaps the least memorable track on the album similarly builds into a full on harmonied watershed, before the lapsteel of "Breathe Easy," and the concluding acoustic darkness of "Badlands." 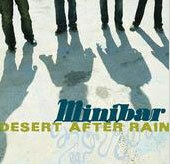 Somewhere in the midst of all that is the best song that Minibar have ever done - "Fly Below the Radar," sounding like a cross between Ryan Adams and Peter Bruntnell and chord changes that turn you into a gibbering wreck well before the song's over. More next time please.